Welcome to the 7th and final day of the First Sale Sprint Challenge! Only it’s not even our store – it belongs to Nigel John, one of our students. Today we cover the final steps to take in order to ensure long term success with Shopify drop shipping. 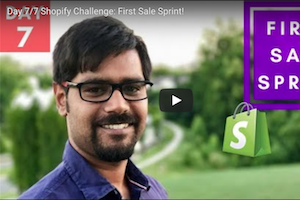 It was a fun, hard-hitting and successful 7-day Shopify Challenge! And because of that, this 7th and final day, is 100% dedicated to you. The major point of this challenge was to show people how to get their first sales. We wanted to reduce the noise and nonsense that floods this industry, while utilizing the basics. Obtaining the first sale is one of the biggest obstacles people face when starting out. So many people put in hard work, don’t see their first sale right away, and then quit. That is not the way to approach this or any other industry if you’re serious about being successful. While these past 7 days were a success, and Nigel’s store (UrbanSigma) has received its first sales, his journey has just begun. He’s going to need to stay on top of things. Things like monitoring his ad sets, adding and testing new products, and regularly implementing all of the new technique he’s learned. Q: Oberlo or ZeroUp for a new store? Because it is free, it is definitely the choice for new stores and beginners. Once you’re generating sales, then you can make the switch to ZeroUp. Q: Can you sell Clickbank products on a Shopify store? Especially with digital products. But you’ll probably want to focus on your own products, and products found on AliExpress as this is where the greatest profit margins will be achieved. Q: Is Facebook trying to get rid of drop shippers? Facebook Is Getting Rid Of Low Quality Advertisers. Q: If I purchase your custom drop ship theme and need help with it, who do I contact? Q: What taxes are you paying since you advertise worldwide? We have a subsidiary company registered in the US, so we are paying income taxes based on our net profit here and Rito pays income tax based on his Indian company as well. Q: Since you’re at least doubling the price of every AliExpress product you sell, won’t people feel cheated when they receive their order? A: Yes, if you send an invoice with it. This is why you want to mention to your AliExpress supplier that you do not want an invoice included with the package. They are familiar with this, so just mention it and you’ll be fine. Q: Can I run ads from a country other than the one I reside, because I keep getting banned? A: This is a tricky one. You’ll want to read through all of your Facebook Advertising policies first. Ensure you are compliant with everything. Odds are, your country is not the issue, it’s more likely you’re doing something else that they don’t like. Read through them first because there are some types of products that Facebook doesn’t like and it can get you banned. If you feel you are compliant, then focus on your ad copy and ad creative. If you are not writing in proper, grammatical English, or you are blatantly copying other ads, your account will get banned as this lowers the quality of the ads Facebook displays. The other thing to ensure, if your account is frequently banned, is whether or not your credit or debit card works and or has funds available. Again, if you don’t have a card that Facebook can charge, your account will be banned. Q: How to avoid confusion with the FB pixel when it comes to a niche or general store? It learns which products it’s advertising for. You should be fine regardless. If you are concerned, you can always give the app, “Trackify” a go. Q: Is it true anybody can see which ads any Facebook page is running? This is something was tested in Canada earlier in the year, and has actually rolled out worldwide. You can now go to any fan page, look at the bottom left sidebar and click, “Info and Ads” to reveal where and what they’ve been advertising. It’s problem because people can also see your ads, but it’s an opportunity because you can see your successful competitor ads. The advertisers who are going to thrive with this change to FB ads, are the ones who are importing and filming their own product creatives. Q: Can I Package My Own Drop Ship Products To Improve Customer Experience? With a company like 3PL you can implement custom packaging. Once you find out your big sellers, you can import a bulk order to either a China or United States where to then ship them with your own branded packaging. Q: How Should I Begin Drop Shipping? Get as much knowledge as you can. Go through Bizathon3 in its entirety, then watch Bizathon4, Bizathon5 and Bizathon6 prior to following along with the First Sale Sprint. This way you will have a solid understanding of the big picture regarding drop shipping success. Q: I’m Under 18 But Want To Start Drop Shipping, What Should I Do? Paypal and Facebook both want you to be at least 18 to do business with them. So our advice would be to partner with a motivated, trustworthy person whom shares similar goals as you. Q: Do I Need An Import/Export Code To Drop Ship Within India? A: Yes, If You’re Sending Products To India, You Will. If you’re just drop shipping from China to the United States or just about every other country, you probably won’t need to worry about this. But if you are drop shipping to customers based in India (which we don’t) then we believe you will in fact need your Import/Export code. Q: Should I Quit My Job & Dedicate 100% Of My Energy Toward My Store? A: No. Not Until Your Store Matches Your Current Income. Never put your eggs in one basket. Do not quit school or your current job until your Shopify store is making a livable income. If you quit before your store is making money, it will be incredibly difficult to grow the store, not too mention much more stressful, which takes away from creativity and positive energy. Q: How Do I Identify Whether Or Not I Have A Winning Product? Q: When Should I Start My Retargeting Ads? Wait until your primary campaign, for whatever product(s) have sent at least 100 unique visitors to your store. Q: How Can I Quickly Accumulate Cashflow To Begin Drop Shipping? Search our posts for “Help I Don’t Have Money” and you will see this post. Q: Is Shopify A Fad? Shopify and drop shipping will be around for a long time… In fact, many people don’t realize this, but Shopify is a publicly traded company. That’ll do it for Day 7 of the First Sale Sprint – Well done! I want selling Items form china and ship to U.S customer. 1) Do I have charge taxes For US Customer when he order order. 2) Do I need EIN for Our Business & where I get Form. 3) Do I need LLC To Get start & what The Best Service Provide .